This post is mostly the same as my recent article in CompetitorRunning.com. 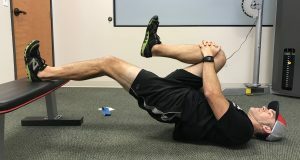 I discuss several exercises in the article designed to help runners overcome common painful issues related to running. For this post, I include pics and videos of the exercises. Here it is. Chronic pain is frustrating. Painful feet, ankles, knees, hips, and low-backs are common in runners. Chronic pain may bring fear that you’re broken, weak, and fragile. Thus you avoid many meaningful activities. You may obsess over your pain. This is the fear-avoidance cycle and it fuels itself. Chronic pain is different from the pain of an acute injury such as a bone fracture; dislocation; or a cut, scrape, burn, or puncture. Chronic pain lasts long after an acute injury has healed. Pain serves a valuable purpose but with chronic pain, the pain remains after it has served its purpose. Chronic pain comes from a “broken pain system,” akin to a car alarm that goes off for no reason. Fortunately, you can overcome chronic pain and start running again. Beliefs such as you’re broken and further activity (running) will break you more. Coping strategies: Avoiding running out of fear which drives you deeper into despair and further sensitization. Tissue stress: Tissue stress can definitely contribute to pain. Remember though, tissue damage is typically a minor contributor to sensitization. All of the above factors may be kindling for a pain fire. One too many stressors may spark the fire. 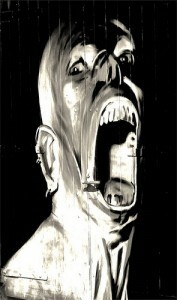 You feel pain when the accumulation of stress exceeds your brain’s perceived ability to cope. There are two ways to tackle pain. One way is to decrease the stress that contributes to pain. Another way is to increase your resilience and get strong. Load and strengthen the place that hurts. Your bones, connective tissue, joints, and muscles are very strong and they respond well to loading. If you’ve been guarding and resting part of your body then it gets weaker. Structures like the Achilles and patellar tendons need strength, not more rest. 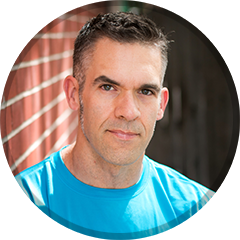 Physiotherapist, chiropractor and pain expert Greg Lehman favors gradual strengthening as one of the best ways to reduce pain. Get strong – Load it! Loading strengthens muscles and connective tissue while and provides an analgesic effect. Physical activity boosts your mood, builds self-efficacy, and shows that you’re not broken. By engaging in exercise you break the fear-avoidance cycle. Here are several exercises to help with several conditions. A comprehensive guide is beyond the scope of this article. Isometrics work well to calm pain. Contract and hold with no motion for 30-60 seconds. Perform isometrics frequently throughout the day. fascia pain. Use a bent or straight knee. 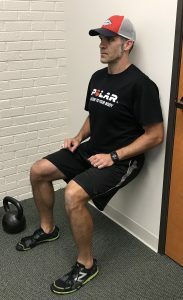 Below: Wall sit for patellar pain. Progress from two to one leg. Below: Straight-leg bridge for glute/hamstring pain. Progress from two to one leg. Exercises should be exhausting in 5-10 slow, deliberate reps. (Most of these can also be done as isometrics too.) Start with bodyweight then add weight via barbells, dumbbells, kettlebells, weight vests, machines, or rubber tubing/bands. Persist into pain no higher than a 4 on a 1-10 scale. Heel raises for Achilles tendonitis can be done with a straight or bent knee. Loading the knee and hip reduces knee pain. Exercise is medicine. If you’ve avoided running for a while then it’s time to run! A little bit of running will help you understand that you’re not broken and the physical activity will help calm your nervous system. You’ll use the process of graded exposure. Add work gradually, keep pain at a minimum, and you’ll increase your capacity for activity. Perform each workout twice per week on non-consecutive days. Pain should be no higher than a 4 on a 10-scale (1 = no pain, 10 = very painful) and pain should not alter your running form. Don’t push through severe pain. It’s not uncommon for pain to flare up after activity. Don’t be alarmed. You haven’t done more damage. You’ve pushed a boundary and your nervous system has overreacted. Reduce your activity level a little bit next time you exercise. You may need more information beyond this article. A physical therapist or other medical professionals can help guide you through recovery. Injuries such as stress fractures definitely need to be unloaded and rested. If your pain gets worse with activity then seek medical care. Moving and using our sore parts–confronting the pain–is essential to getting rid of pain. Though this is a popular concept, there is significant evidence that “core strength” (which can be defined and measured in a multitude of ways) has nearly nothing to do with back pain. I think this might be part of an effective strategy to address runner’s knee (if the problem is rooted in the hip which it often is; however it could be rooted in poor control of the foot and ankle), but there are several dots that I think need connecting between this exercise and full-on running. This exercise is very different from running in which the foot impacts the ground and the runner must control motion at the foot, ankle, knee and hip. If this is the only exercise given to a runner’s knee patient then I’m skeptical that the runner will fully overcome the issue. This is an interesting idea but I have strong reservations. Pain is a signal that should be respected. Even though pain doesn’t equal injury it’s still a message from our brain that there is a perceived threat that needs to be addressed. The pain could be signaling a threat related to poor movement control and tissue stress is leading toward injury. By taking a pain-blocking drug, we might simply be turning down that signal as we continue with what may turn into an acute injury. I would compare this to driving a car with a damaged muffler that needs replacing and instead of replacing the muffler, we turn up the stereo loud: No noise! !–but have we fixed the problem? On the other hand, I understand that even if the movement problem is addressed, we may still feel pain. Taking a drug may help the brain experience the new, better movement in a painless way which might help break the chronic pain cycle. I’m curious to what degree this has been method has been investigated. For me, as a personal trainer, I would never suggest someone take a drug and just keep going. Rather, I would speak with the person’s PT. If he or she OKs it, I would then advise someone to move and work below the pain threshold or at a very manageable level of pain. A few weeks ago I had a very interesting experience regarding my ACL rehabilitation. It’s very similar to an experience I had with Achilles tendon and heel pain. Here it is. I had ACL reconstruction on May 1, 2014. I have been very aggressive with my rehabilitation and I felt it was going very well. My PT and I agreed on a strategy and he approved of the process in general. I knew that sitting and resting was not the right way to go if I wanted to regain full function. For people like me, laziness wasn’t a problem; an overly aggressive approach might be though. I backed off lifting, running a cycling. I didn’t stop my activity completely but I cut it back significantly. After a couple of weeks I realized the knee wasn’t feeling much better. I continued to experience frequent pain; not debilitating but somewhat worrisome. I decided a visit to the PT was in order. I wanted to get some guidance and make sure I hadn’t damaged the graft. From here, I was ready to rock ‘n’ roll. The relationship between pain and the state of the tissues becomes weaker as pain persists. Yes I had an injured knee and yes I had surgery in which part of my patellar tendon was cut out in order to make a new ACL. This was all very disruptive to parts of the knee and was clearly part of the pain I was feeling. It takes about six weeks for the graft to heal. The reconstructed ACL is pretty much healed at six months which would’ve been October for me. In other words, my knee was/is healed and any pain wasn’t from tissue damage. Psychological factors play a key role in the development of chronic musculoskeletal pain, in particular dysfunctional beliefs about pain and fear of pain. 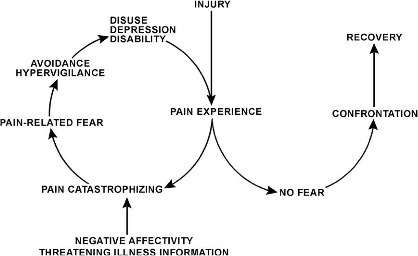 Fear of pain leads to avoidance of activities (physical, social, and professional) that patients associate with the occurrence or exacerbation of pain, even after they may have physically recovered. Whereas this response is adaptive in the acute phase—rest promotes recovery—it leads to disability and distress when avoidance behavior is continued after the injury has healed. When I learned that my parts were solid and strong and that I wasn’t broken, I felt the fear drain away like water down a toilet. I was a happy dude! Another of Moseley’s points is important here: that pain can be conceptualised as a conscious correlate of the implicit perception that tissue is in danger. In even simpler terms, we may feel pain absent any damage but we feel pain when our brain perceives a threat–even when there is no threat. I compare this to a car alarm that is set off by the wind. There’s no break-in occurring yet the alarm signal is going off due to the alarm sensing a threat. 3) Patient education is vital: Very interestingly, an effective strategy in treating chronic pain is patient education. 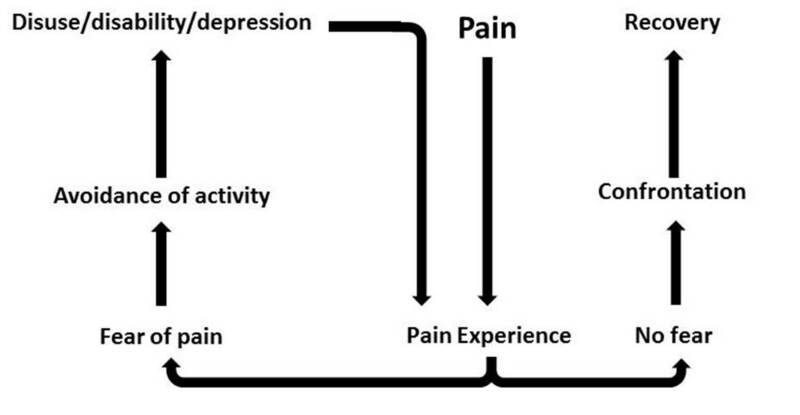 This strategy of patient education is supported in several studies that are discussed in a review in the Archives of Physical Medicine and Rehabilitation, and it’s further discussed in an article titled Can Pain Neuroscience Education Improve Endogenous Pain Inhibition? Literally, knowledge of pain processes can reduce pain. (Pain is weird!) I believe that my experience supports this phenomena. “The idea that an inaccurate understanding of chronic pain increases chronic pain begs the question – what happens if we correct that inaccurate piece of knowledge? Most of us outside the medical community probably still equate pain to damage. Many inside the medical community still think that way too. (Blame Rene Descartes.) We now know better. Rather than address pain from a strictly biomechanical approach, therapists would be well advised to study and adopt what’s known as the biopsychosocial model for pain. This model is explained very well here and discussed in-depth here. 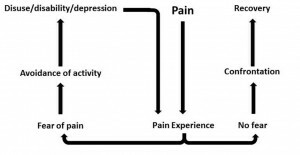 We patients will be well armed in a fight against pain if we understand this model too. This piece about my heel pain was in the works prior to my ACL mishap. It was great to banish my heel pain! I’m still happy about it! Now I just have to overcome this latest speed bump and all will be well. In Part I of this post I discussed my consultations with coach Mike Terborg and therapist Nick Studholme. We were trying to figure out how to resolve some very persistent heel/Achilles tendon pain that had been with me for several years. Their work was biomechanical in nature. They helped me to move better, run better and unload the sensitive tissues. Here in Part II I want to discuss another important component to pain management, one that has less to do with biomechanics and everything to do with how we think about pain. Z-Health is where I first learned about these concepts. I drifted away from Z-Health a bit but I’ve returned to my learning about the realities of pain. Pain is in the brain. It’s a blend of nociceptive (danger) signals, attitudes, beliefs, past experiences, knowledge, social context, sensory cues. It doesn’t equal tissue damage–particularly in chronic pain cases like mine. Pain is a response to a perceived threat. Reduce the threat and we reduce the pain. Obviously there’s a lot of subconscious stuff at work when we experience pain. If we want to tie our shoes or turn the ignition key of a car, we have to consciously take action to make these things happen. In contrast, we don’t have to think at all in order to feel pain. We feel pain without having to consciously do anything. However, research into pain reveals that we can often actually reduce our pain via cognitive processes. Based on this meta-analysis, patient education interventions provide additional benefits that are 20–30% as great as the effects of NSAID (non-steroidal anti-inflammatory drugs) treatment for pain relief in OA and RA, 40% as great as NSAID treatment for improvement in functional ability in RA, and 60–80% as great as NSAID treatment in reduction in tender joint counts in RA. Here, patient education offers benefits beyond that seen with drug treatment alone. Top Down: Basically, means changing your attitude, beliefs, knowledge (neurophysiology of pain) about your pain and in turn, lowering the threat value of pain. People get hurt, they experience pain, healing follows, and they recover. But in some folks the pain lasts forever. And why is that? According to one of the most well-accepted models – the fear-avoidance belief model – people who have heightened fear of re-injury and pain are good candidates for chronic pain. Lack of knowledge or incorrect knowledge, beliefs ( hurt always means harm, my pain will increase with any activity and so forth), provocative diagnostic language and terminologies used by medical therapists like herniated disc, trigger points, muscle imbalance, and failed treatments can further heighten this fear or threat . So education to lower the threat is THE therapy here. We now have some very good evidence to show that just pain physiology education or the top-down approach is enough to lower pain and improve function 5. Bottom Up approach: The bottom-up approach is what we see around us: surgery, postural fixing, trigger point, muscle imbalance, movement re-education, manual therapy, acupuncture and the list keeps growing. Almost all treatments out there are trying to lower the nociceptive drive without much consideration to the top-down approach. This is solely because these treatments are based on the outdated model of pain. We now suspect that positive effects of manual therapy may be due to neural mechanisms than the tissue and joint pathology explanations that is often offered. So even the bottom up approach is working via de-sensitizing the nervous system. Although not intended, there are top-down mechanisms clearly at work even in bottom up approaches( like the placebo effect, a credible explanatory model, the belief in the therapist) . So what we you need is a combined approach that takes into account the “entire individual” and that’s where the biopysycosocial model of pain treatments walks in. The bio psycho addresses the biology (nerves, muscle, joints), psychological ( beliefs, thoughts, fear) and social aspects (work, culture, & knowledge). I started feeling a little like Stuart Smiley as I gave myself these pep talks–but guess what!–they worked. Literally within 48 hours my residual pain was gone! This conscious thinking process seemed to influence the unconscious pain process to a very favorable result. This model is known as the pain neuromatrix. and it is very powerful stuff. It may sound odd this idea that pain and injury aren’t the same, and that pain can be changed literaly through education. I haven’t made any of this up though. This is what the researchers are finding. I sustained an acute knee injury that includes a torn ACL. Did it hurt? Oh yes! It was a sudden change that my brain rapidly assessed as a significant threat. The result of the injury is instability in my knee and I can’t move as much or as well as I could prior to the injury. From an evolutionary standpoint, I’m at a disadvantage for survival. Pain is helping me avoid further damage. I will most likely undergo an ACL reconstruction (I hope to know for sure next week.) with plenty more pain to go along with it. But I’m not worried. I’m highly optimistic that I can be fixed and that I can return to all the activities I love. I’m exercising as much as possible while at the same time avoiding pain. In this way I’m calming my brain and minimizing any feelings of depression, 2nd guessing, or any “woe-is-me” thinking. I must be patient and diligent with my rehab. I will! To reduce threat, my return to exercise (particularly Olympic lifting, trail running and skiing) must be gradual and non-threatening. Lorimer Mosely is one of the foremost pain experts on earth. Here he lectures on pain. Around the 7 minute mark he discusses his own experience with a very dangerous yet painless wound. The whole thing is fascinating but perhaps a bit long for some. If you’re in pain though I strongly suggest you watch it. Also, here’s a link to an interview by Bret Contreras with physical therapist Jason Silvernail. Many good questions are asked and very well-informed answers given. Again, it might be long for some of you but the information is just hugely valuable. Remember, learning about pain can help you overcome pain! Reading and listening to those who understand pain can be hugely beneficial to anyone who suffers. Below are more resources. If you haven’t read or heard about it, the New York Times recently ran an article titled How Yoga Can Wreck Your Body. It’s far from the perfect article. For one, it’s full of anecdotal evidence. Second, many of the examples given of yoga causing injury consist of people doing rather extreme versions of a pose or movement. I think the article does bring up valid questions: Can yoga cause harm? Is it always safe for everyone? I’ve had a couple of harsh experiences with yoga. Once I had a teacher that thought since I looked big and strong I could do some sort of headstand. I figured I would follow the teacher’s lead and give it a shot. Without question I was not ready for this pose. I left the class with a very painful shoulder. This instructor had been teaching for years and was very highly sought after at the gym where I worked. I was in another class where an instructor all but insisted that I move deeper into a pose and I simply couldn’t do it. My nervous system was trying to protect me by preventing further movement into this position and she had me trying to force my way into a deeper range of motion. Again, by the end of class, I was in a bit of pain. This is not what I was after. My observation is that yoga is often championed as a panacea cure-all for any number of ailments: back pain, knee pain, mental stress, possibly even digestive issues. I can’t say everyone says this type of thing but in every gym setting where I’ve worked yoga is discussed and presented in this glowing fashion. But is yoga really any different from any other type of exercise? Might there be a few risks? First and foremost, yoga is movement. So is running a 100 m sprint. Driving a golf ball is also movement. The power lifts are movements. Typing on a keyboard and watercolor painting? Also movement. Guess what: Movement can cause injury! (By the way, try NOT moving and see how healthy you become.) Further, yoga is a lot of very different movements. One may be quite safe, another quite unsafe. All parts of yoga can’t be viewed fairly as the same thing. We can probably agree that movement is essentially necessary and usually healthy. We can probably agree that walking is typically safe and healthy. But what if we have a sprained ankle? Or a damaged vestibular system such that we can’t tell which way is up? Then even walking might be quite harmful. Lifting weights is similarly healthy in most cases. If we have a herniated disk or if we use bad technique then lifting may be very unhealthy. Why would we view yoga as any different? If we have poor kinesthetic sense then moving into any number of poses could cause pain and/or injury. Further, we as Americans often have the view of “If a little bit is good then a BIG WHOLE LOT must be great!” More is better in other words. I’ve heard some yoga people speak proudly of not only how deep they can move into a pose but also how quickly they can move from one pose to another. Sounds a lot like the talk in any weight room. Just substitute weight and reps for poses and depth of motion. Glenn Black is an experienced yoga teacher who’s interviewed for the Times article. He speaks to other yoga teachers and practitioners on the issue of injuries. He talks about ego. (I think the popular image of yoga is that it is an ego-less type of thing. But what human activity is free of ego?) Black says, “My message was that ‘Asana is not a panacea or a cure-all. In fact, if you do it with ego or obsession, you’ll end up causing problems.’” This seems a very wise statement, and I’m pleased that this article may start to shed light on the idea that yoga should be evaluated the same way as any other type of exercise. Anyone who’s experienced chronic pain knows it can be a very mysterious issue. Chronic pain presents very different characteristics and patterns when compared to acute pain such as a skinned knee or a sprained joint. It may start for no clear reason and progress with no clear pattern. A long-ago healed injury may continue to hurt even though the tissue is no longer damaged. Oddly enough even amputees and paraplegics may experience pain emanating from missing or non-working limbs. Chronic pain seems as if it’s driven by a very mysterious force. The issue of hope–or hopelessness–can be a truly crushing burden in the quest to resolve long-term pain. Typical methods in addressing chronic pain may include drugs (ibuprofin, steroid shots, muscle relaxers), heat, ice, physical therapy, chiropractic adjustments, massage (Active Release Therapy, myofascial release, Rolfing, and others) and acupuncture, and then if none of the above works then we often resort to what certainly must be the final sure cure: surgery. These methods often provide temporary relief at best. This past weekend I attended the first half of the Z-Health R-Phase certification. Pain and resolving pain was the overarching theme. I learned a tremendous amount about the issue. As many people have observed, pain doesn’t always equal an injury. Pain sometimes feels better with movement: someone with a slightly sore shoulder may feel better as he or she moves the arm around. In contrast, pain often does indicate an injury. If I break my leg and I continue to walk, then the pain will increase with every step. Emotions are often overlooked when we deal with pain. Again we often think of pain as strictly a bodily thing. Still a lot of us have noticed that our pain increases during times of stress. This is an indication that we must consider our mind and our emotions when we’re trying to resolve long-term pain. It may be that our “physical” pain is rooted in the conditions that surround us. In fact what happens in many cases is that the pain itself causes us such distress that it becomes a self-perpetuating situation in which our fear of pain drives only more pain. It’s an enormously complex matter when we start to look inside our head in order to address pain; but if we’re not considering the inside of our skull then we’re probably missing the mark by a long shot.